People are crazy to share Hindi Attitude Shayari on Whatsapp and Facebook. Every boy and girl wants to set up a Whatsapp Status that shows his/her Attitude and Personality. 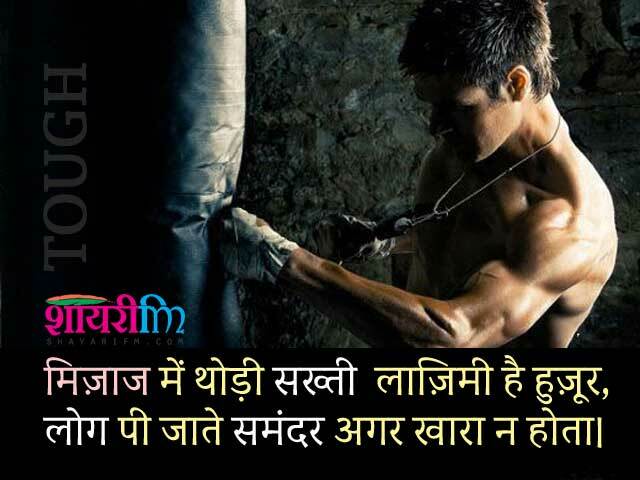 If you are looking for Latest Attitude Shayari then you are at the right place. Here you will find Best Attitude Shayari (रवैया शायरी), which you can share on social media with your friends. Khairat Mein Toh Hum Tumhari Mohabbat Bhi Na Lein. Kabhi Pairo Se Raundi Thi Yehi Parchhaiyan Humne. Pehchan Apni Dur Talak Chhod Jaaunga. Sheesha Hoon Toot Kar Bhi Khanak Chhod Jaunga. 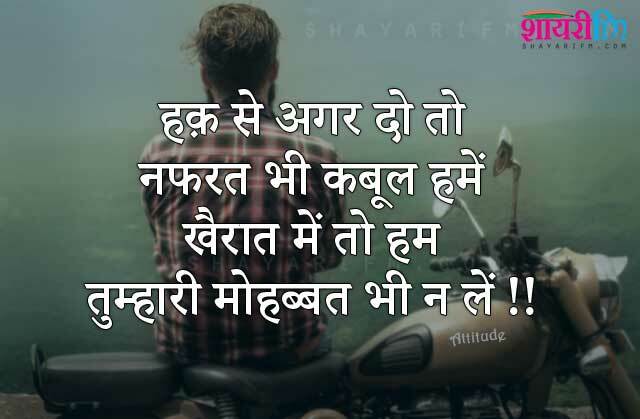 Our collection has a variety of Attitude Shayari in Hindi like Akad Shayari for Boys, Aukat Shayari, Pagli Status for Girls, Positive Attitude SMS, High Attitude Shayari, Shakhsiyat Shayari, Haisiyat Shayari etc. 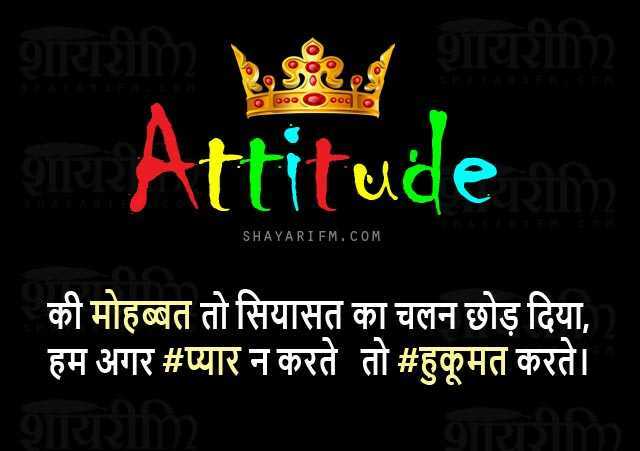 All Shayari about Attitude posted in Hindi and English language both, Which can easily be shared on social media. Hum Akele Poori Mehfil Ke Barabar Hain. Usne Haath Chhudaya Toh Humne Chhod Diya. Some Attitude Poetry that you read above, you definitely would have liked. In the subsequent pages, we have posted a lot of Hindi Attitude Shayari, where you can find your favorite Shayari matched with your attitude. If you like our Attitude Shayari Collection, then share it with your friends as a WhatsApp Status.